I sat in the back of the dimly lit cathedral on Maundy Thursday for the renewal of the ordination vows of the Episcopal priests in the Diocese of Tennessee. Outside, the brightly lit spring day was in full bloom. Inside, the lights were dimmed and a row of flickering candles on the altar pointed toward a sacred and shadowed space. There were about fifty priests in front of me, mostly with haloed gray hair bent forward in prayer. What struck me beyond the sea of black with old tweed sweaters over tired shoulders were the backs that looked a little humped. I imaged the years of prayers prayed for themselves, their congregations, and all the stories that were stored in their sealed hearts. Collectively they represented hundreds of years of stories and prayers offered for the sake of their part of the vineyard. I felt compassion for the years of listening and bearing the burdens of those who had suffered and reached out for a tender ear. I could imagine how they had presided over funerals, gone to hospitals in crises, and offered forgiveness and a way of acceptance in terrible times. There was holiness about the gathered community, singing in older, thin voices about sacred woundedness. There was something beautiful about the suffering they seemed to be carrying in their bodies, and I wanted to believe that it was worth it all. Suffering places us always on holy ground, and that is why this week is called Holy. It is the week to remember the suffering and holiness of God that is present in that suffering. It is the embodied life of suffering and the reality of its toll under our eyes, on our chest, in our bellies, that places us near to the heart of God, especially this week. And witnessing the silent suffering of the priests on behalf of the communities they served brought me a tiny bit closer to the suffering of our Lord on this holiest of days. Two years ago John Thatanamil, a professor of Theology, preached at St. Augustine’s that today was the coronation of love-- that offering your body for the sake of God’s love in the world was indeed the lived theology of the Gospel. We are called to lay down our life for a friend. When I imagine myself at the foot of the cross, grieving and weeping, I imagine that witnessing his suffering would bring me great compassion for the life he lived. I could see him making his way slowly to Jerusalem, stopping and stooping and listening and loving all those he encountered who were suffering. At each point, bent over, he would bear a little of their suffering for the sake of love. I can imagine seeing, in his bent and broken body, love pouring out of him, and wishing that I could bear such love. He embodies on this holiest of days the ultimate suffering for the sake of love, hours on the cross for loving the whole world, and it makes me want to bear more for the sake of love. So I sit in dimly lit cathedrals on bright and sunny days and silence my phone to hear and witness others who give a testimony by their hunched backs and grey hair that loving one another is possible, and it brings us closer to the love of God that we long to know. It’s finally starting to sink in. At least that is what it felt like as the ashes burrowed into a wrinkle in my brow on Wednesday morning. 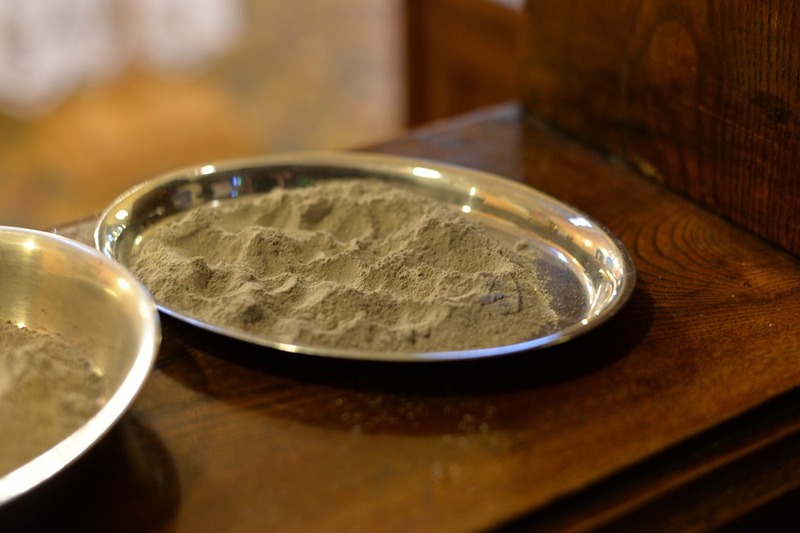 For 16 years I have participated as a minister in Ash Wednesday services saying over and over “Remember that you are dust, and to dust you shall return.” I have loved the humility and simplicity of the statement and the many, many, stories around the foreheads I have touched. This past Wednesday, however, the words were as powerful as I have ever heard. I could feel the enormity of the prayers before and after the imposition of ashes. I could feel the dignity of the long line of communities willing to forgive and love one another in this ritual. I could feel the power of people praying together to strengthen one another. Then, I came home and my son asked me to wipe the ashes off, which were now in a furrow of my brow. It was beautiful to think that after all these years of preaching and praying the ashes were finally sinking in and that the journey back to dust may happen slowly and with grace. It was a beautiful Ash Wednesday. Epiphanies are events in which God’s incarnate love is revealed. My Epiphany began as I spotted a hillside with dried thistles. I pulled to the side of the road and just as I picked the first downy blossoms it dawned on me that I was becoming a thistle farmer. These thistles were there for anyone, but they felt like a present for me, free and wild, holding the capacity to make beautiful paper. To be a thistle farmer means the world is a plentiful field, and we can harvest beauty from weeds and abandoned lots and through action preach love and hope. It was strange to think that it had taken me six years of being a part of Thistle Farms to come to that realization. The moment was six years in the making, but it was even longer than that in coming. Thistles were one of the first sights that stood out on our first trips into the streets thirteen years ago. They were the flower that donned my mother’s china. If I could ask her why she chose the thistle for her bridal plates, I bet there would be a story about my grandfather who was a farmer. If I could ask him about the thistle, the story would eventually carry me across seas and generations of farmers and faithful pilgrims. Somehow my small Epiphany connects me to a line of Epiphanies that span hundreds of years. The church teaches us that there are three to celebrate: the coming of the wise men to see Jesus in Bethlehem; Jesus getting baptized in the river Jordon; and Jesus’ first miracle of turning water to wine at a wedding in Canaan. They are not separate events but part of one Epiphany with countless manifestations of how God’s love is revealed to us. Epiphanies have never come out of thin air. The reason that Jesus was born in Bethlehem can be traced back generations to the story of Ruth. Her mother-in-law, Naomi, traveled to Moab because there was famine in the land of Judah. There, her two sons married and some time later, died. When Naomi was leaving Moab, Ruth begged her to go with her saying, “Where you go I will go and your God will be my God.” Ruth came to the land of Bethlehem. Her loyalty to Naomi and her faith led her to marry, Boaz, and they had a son, Obed. Obed was the father of Jesse, and Jesse was the father of David, and so the line continues until Mary and Joseph in the year of the census travel back to Bethlehem, David’s home. It is the history of faith foretold by the prophets in Isaiah and the Psalms and the priests around the time of Jesus’ birth knew it. The wise men came to Jerusalem, not Bethlehem, and after consulting the vassal king of Rome, Herod sent them to Bethlehem. Ruth, Jesse, Herod, are all part of the Epiphany. The same is true for us. Epiphanies are experienced in specific time and place and in particular political realities, but they move past specifics as they connect us to universal and timeless truths. They seem like fragile or passing thoughts, but they are strong and change the balance of love in our world. Your revelations of God’s love for you and your place in the history of love are not fragile or disconnected. The wise men in the Gospel are a caste of people from the east that can interpret dreams and understand astrology. After the Gospels were written, the Church elaborated that there were three men carrying symbols of virtue, prayer and redemptive suffering. They came because the cosmos offered another sign of God’s love unfolding. That star had been burning for countless millennia, maybe it was a supernova dying, and the men were drawn to its light and force. We have all looked up into the heavens like the wise men in awe and wonder. Christmas Eve, 2007, the skies were clear and cold, and the full moon was glowing. In it you could see craters like grey shadows, and all around it shown a halo of light. Its majesty increased as I remembered the whole world sees the same moon, and all our lives pass by it quickly. In the moon’s shadow you can feel the connection between all the births and deaths and epiphanies of our lives. You can picture a child under the same moon pumping water from the well in Ecuador; a nurse offering food to a man dying of AIDS in Botswana; a monk assisting a blind child through the corridors at the orphanage in Vietnam; a woman picking a thistle by the side of a road; and people offering kindness to strangers and the other million acts done by countless men and women for countless years under this same moon. In each act there is a moment or glimmer of grace when the skies open and we feel a part of God’s loves for the world. May your epiphanies this year bathe you in new light, remind you of all the epiphanies that led you to your new place of wisdom, and ground you even more firmly in your knowledge and love of God. To listen to this reflection and "Consider the Thistle" written and performed by Marcus Hummon, click here.